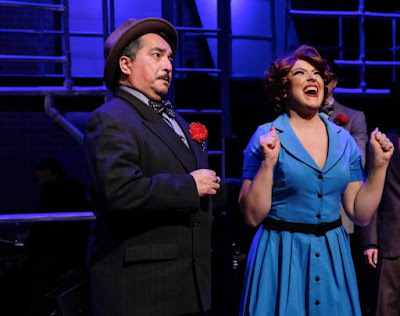 Carol's Theatre Reviews ~ It's Fun To Go Out: Coronado Playhouse’s “Guys and Dolls” Worth The Drive Over The Bridge. 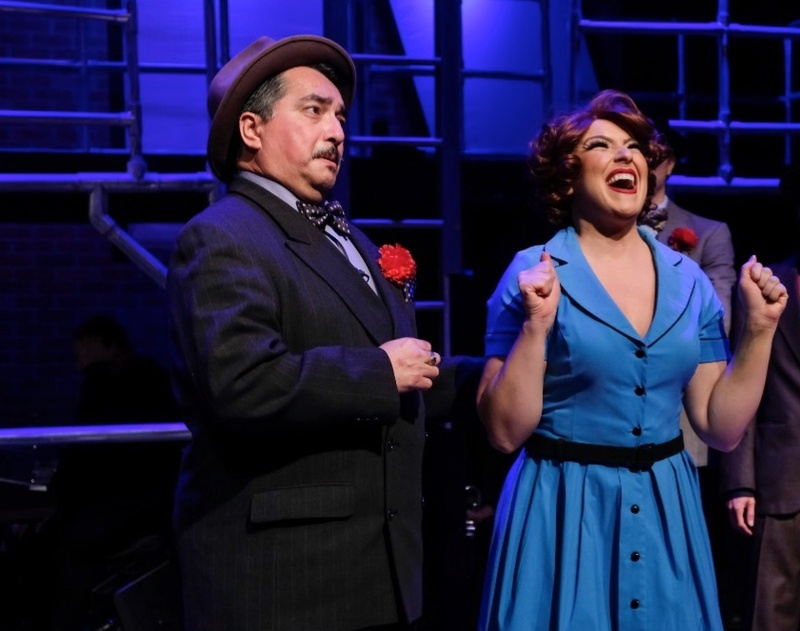 Coronado Playhouse’s “Guys and Dolls” Worth The Drive Over The Bridge. One of my all time favorite musicals “Guys and Dolls” can now be seen on the stage of the Coronado Playhouse through Feb 24th just in time for Valentines Day. And what a great Valentine’s Day present it will be for some lucky Guy or some lucky Doll. 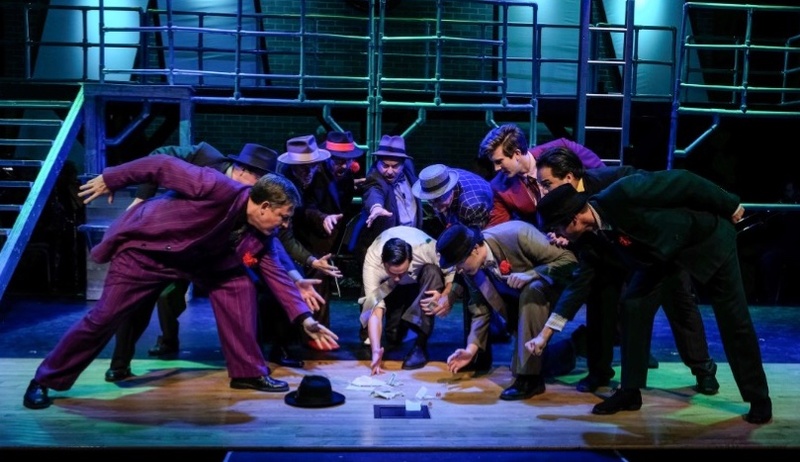 Based on Damon Runyon’s stories of New York showgirls and gamblers, and adapted by Frank Loesser (music and lyrics), Jo Swerling and Abe Burrows (book) this fable is by far one of the all time perfect musical comedy classics. It’s clever, smart, and gruff yet loving, with a language all unto its own known only to those characters shared to us by Runyon. It is marked indelibly into our collective memories and it wouldn’t be out of character for yours truly to start humming “I Got The Horse Right Here”, if something reminded me of the show. The musical is based on “The Idyll Of Miss Sarah Brown”, a short story by Runyon. It was first produced on Broadway at the 46th Street Theatre where it opened on November 24, 1950. Initially, it ran for over one thousand performances and won five Tony Awards including Best Musical. George S, Kaufman directed and the inimitable Vivian Blaine starred as Adelaide, the gal who suffered with a fourteen year cold (“Adelaide’s Lament”), while waiting for her man, Nathan Detroit to show up at the church to get married and give up gambling. 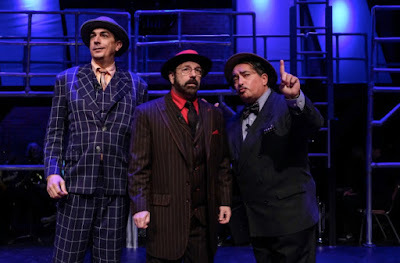 In his review of “Guys and Dolls” John Chapman of The Daily News said, “The big trouble with “Guys and Dolls” is that a performance of it lasts only one evening, when it ought to last about a week”. …. “For here is New York’s own musical comedy…." The characters, and I mean characters have been permanently etched in my minds eye from the first time I saw the show: “Harry The Horse”, “Big Julie”, Nat’n Detroit”, “Liverlip Louie”, “Nicely, Nicely”, “Jimmy The Greek”, “Benny Southstreet”. Sky Masterson and Nathan Detroit are the ‘guys’ at the center of gravity in this gangsta, small time gambler gig. The main ‘dolls’ are Sarah Brown and Adelaide, the Hotbox Girls and Save –The- Soul –Missionaries. They orbit around Masterson and Detroit taking turns at first ignoring and then loving (Sarah and Sky) and then at loving/hating (Adelaide and Nathan) and then loving. All the dancing and action (Mary Allison Dunsmore choreographs) happens on, in and around the streets, in the Mission (“Sit Down You’re Rockin’ The Boat”) and storm drains (“Luck Be A Lady”) of Broadway in the 40’s. 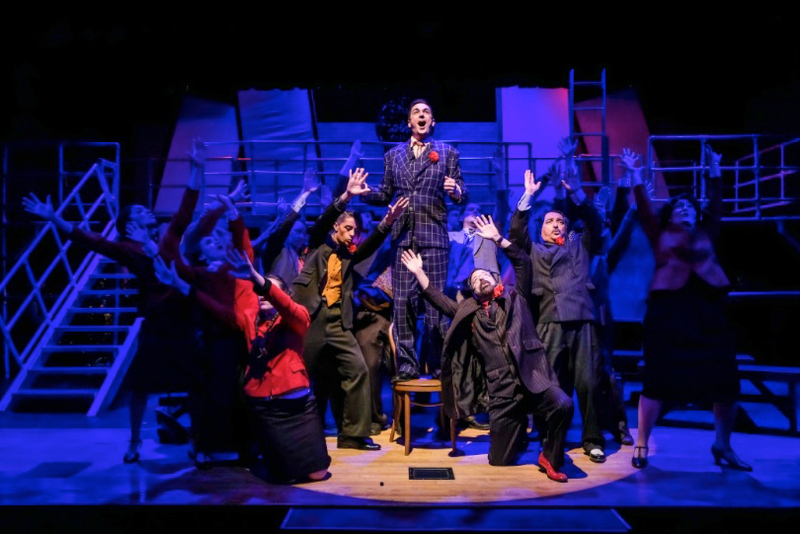 Stan Soth and Justin Allen Slagle designed the versatile set using what looks like scaffolding to expand and heighten the theatre’s small stage with enough room to house the 13 or so piece live orchestra under the baton of Larry Wilson. The two most important ‘dolls’ are Adelaide and Sarah Brown. Adelaide and Nathan have been ‘engaged’ for fourteen years. She is, among other things, the lead singer with the other ‘dolls’ from the Hotbox Club. (“Bushel and a Peck” and “Take Back Your Mink”). Sarah aka Sergeant Brown is in charge of the Missionaries from the ‘Save-a-Soul Mission’. She and her group canvass the streets looking for souls in need of saving. They march and pound to the drumbeat of ‘Follow the fold and stray no more” in their Red Salvation Army looking outfits (Marcene Drysdale designed and or rented the costumes) and “More I Cannot Wish You” beautifully sung by Tom Welch as Sara’s grandfather Arvide Abernathy, chief drummer in The Save-A-Soul- Band. Sarah will end up with the coveted prize, Sky Masterson (“My Time of Day”) but doesn’t know it until after her fortuitous trip to Havana for a lunch date with Sky. Sarah is goodie two shoes and very naïve. It’s kind of like when an irresistible force meets the old immovable object …something’s gotta give” (Jonny Mercer). She and Sky (Olivia Torres and Christopher T. Miller) and Nathan and Miss Adelaide (Dave Rivas and Alyssa Ann Slagle) are the big love interests in the story. All four are well suited for their respective counterparts with the gals a bit stronger than the guys. Olivia Torres who stands less than five feet has a gorgeous soprano voice the likes of which I never expected from this UCSD Science in Psychology major. Color me blown away. Christopher T. Miller’s Sky Masterson is convincing enough in a non -aggressive approach to winning over Torres' Sarah Brown. His sweet non-threatening manner is in contrast to Sky’s I’ve known. It seems director Slagle wasn’t looking for the Marlon Brando type. That said, Miller’s look fits the bill and the chemistry is quite convincing. Both are a find. The show gets off to a little rough start with a few unwanted notes on trumpet (but recovers well) with the catchy “Fugue for Tinhorns” or better yet, “I got the horse right here, the name is Paul Revere…” and were off to the races! Nicely, Nicely Johnson (a terrific David Guthrie), Benny Southstreet (Scott Kolod is another great character) are arguing over which horse will win at the races the following day. They crisscross with the Save-a-Soul Missionaries and before we know it, Nicely and Benny meet up with Harry the Horse (Steven Jensen) who wants to know where the floating crap game is. (“The Oldest Established”) Juxtaposed, Lt. Brannigan (Adam Sheldon), the local cop on the beat can’t wait to nail one of these petty hoodlums for playing craps. He has everyone scattering in different directions. Miss Slagle is a natural; just what the doctor ordered as the wheezing and sneezing the ditsy Adelaide. Her looks and sound resemble somewhat the quintessential Blain exaggerating and mutilating the English language with a heavy New York twang. Once again the Coronado Playhouse is staging another Big Time musical, with great sound (Steve Murdock), lighting (Jerry Wooding) and set. The male dancers are a bit uneven and the choreography comes up somewhat short yet the show still has universal audience appeal and it’s just plain fun to see it live, up close and personal in this small venue. 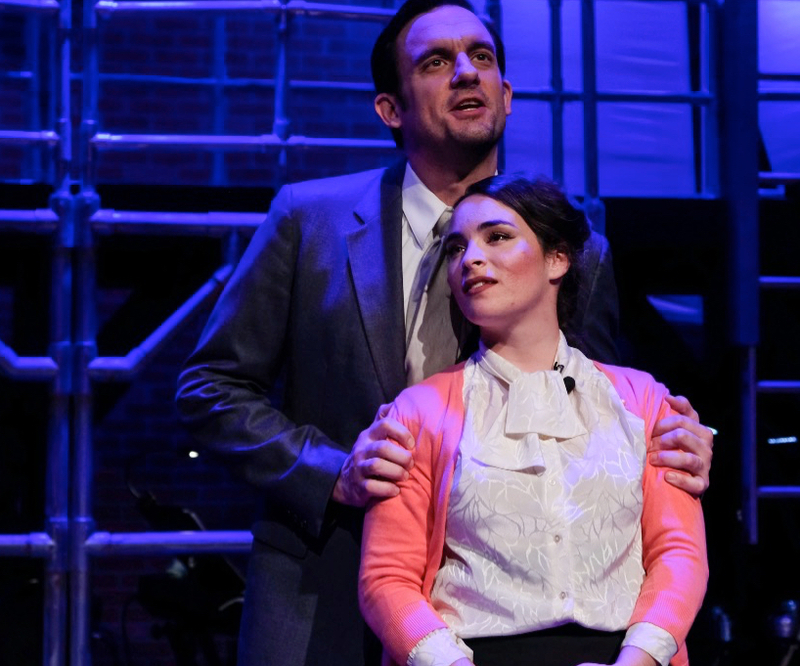 If you live on the San Diego side of the bridge, it’s worth the drive over it to catch this lively production. If you are within walking distance to the theatre, well than, no excuses.